Several years ago, the Clark Boys were making up stories about Helen Keller on our way too see friends. In 1969 we went to the Woodland Park Zoo. Aside from seeing many unknown critters (I was a five-year old Alaskan Bush kid new to the area), and walking the park for what seemed like forever, we got something to eat at the center food area (same spot as now). 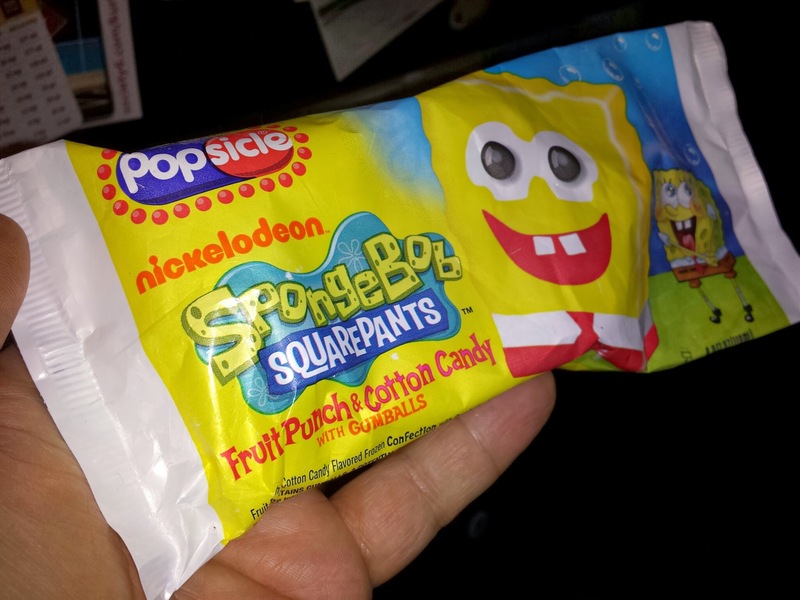 The only thing I recall eating during that visit was Cotton Candy. Now the only thing I can imagine about cotton candy is throwing up. Yep, I hurled my cotton candy on that warm summer evening. Haven’t been able to even go near it since, due to the smell. The mere sight of the word raises bile in my throat to a level that allows me to sing like Janis Joplin. When the stunning Mrs. Sherry Clark spun cotton candy at the church harvest festival, which covered her with delicate webs of sugary hurlage, I could barely contain my stomach. Now you know my food weakness. The word “moist” is almost as revolting to me but the smell of cotton candy beats moist hands down for making me feel like someone is poking a pencil eraser into my belly button. Ever had a scary car? To clarify, have you ever had a car so diabolical that some people wouldn’t ride in it? 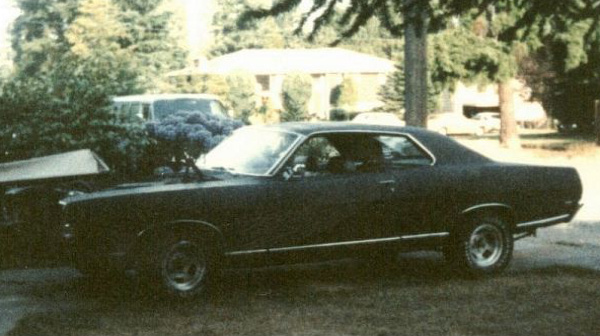 I’ve had a few, including this 1969 Ford Fairlane – which also happens to carry the “scariest car” moniker in my vast spectrum of vehicle ownership since age 14. 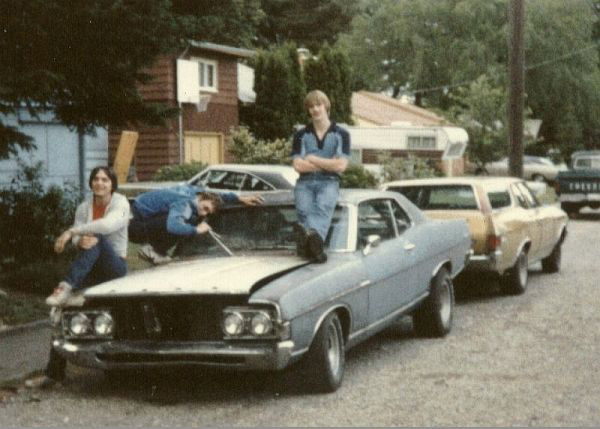 It was something of a neighborhood legend before I got it in 1983, a hashed-out 429-powered veteran street brawler that ended up sitting with a blown water pump next to a friend’s house. That friend is Bill, the one biting off the wiper blade in the picture above; the others are Jeff (big train nut like me) and Dave (loved Coca Cola more than life itself). So how did I end up with the Fairlane? Well, another friend bought the car for $200 and made it halfway home (a.k.a. “my driveway”) before it started making crummy noises. It sat for two months at my house before he offered it to me for free if I helped him move into a new apartment. Never being one to pass up a free car, I did it. The Fairlane was a mess. The hood didn’t stay down because the radiator had been mounted in the way of the hood latch mechanism (which languished in the trunk). Because of this the cooling system didn’t cool. The starter was on its way out. From what I recall the radio worked for exactly one day, but when you have the rumble of a big un-muffled V8 there isn’t much else that a radio would satisfy. The exhaust, piped for the original 351 V8, didn’t match up to the 429 exhaust manifolds, and hung low enough to catch on anything taller than a pebble on the road; previous street rats had tried attach it up underneath, literally with bailing wire. The transmission shifter was a piece of metal linkage hooked directly to the transmission through a hole cut in the floor pan. The driver’s side door window wasn’t hooked to the window regulator, and would fall down into the door if not left out. The rear tires scraped badly on the rear wheel wells. The front end tracked horribly, and wiggled like a freshman sorority girl. Although the car was harnessed with these deficits, it had a good quality as well. It was scary fast. I mean scary scary fast. The fast part was the engine – truckloads of torque and a thirst for premium fuel. The scary part was a steering wheel that would do the Danger Dance at speeds above 85mph (which I didn’t do…..often). Pine needles would fly out of the defrosters at 65mpg. The 429 was a 360-horse plant out of a `70 Thunderbird. I’m not certain how many miles were on the motor, but it was strong. It had a dual-point mechanical advance distributor that I managed to tune with blind luck and straight blade screwdriver. The car had been stripped of all options and frills, so the 429 did quite nicely when moving out in traffic. Second gear and sideways was the rule for any green light. One night I watched a man in a Camaro pull up next to me at 175th and Aurora in North Seattle and follow the lines of the car with his eyes; his expression was one of disdain…until he saw the “429” emblems I had mounted on the front fenders. At that point his eyes got big, his face went blank, and he looked straight ahead. It was clear his plans for a race were recalculated. Naturally, the car needed a lot of attention to be roadworthy. One morning while on a Slurpee run (a mere four or five blocks), the hood flipped up over the windshield at 25 miles per hour because it wasn’t latched down. The fix for this was to remove the hood, turn it over, and bang it straight with heavy objects. Once we reattached the hood latch assembly the hood stayed down. But even after I was done with the water pump, the stupid hood thing, fat dual exhaust, and removal of the inoperative power steering system, the Fairlane still looked like Rolling Death. So, it got a fresh coat of black primer. Now Rolling Death looked nearly acceptable! The 429 made so much heat that the car wouldn’t start after driving just a few miles. I fixed that problem by using the starter from a 360 Ford truck, which was beefier and was less prone to expansion from heat. One day, while visiting a friend in North City, I noticed a guy and his dog circling the Fairlane. When I walked over to him, I discovered that he had been the one who had done the 429 swap. He told me of the trouble he went to installing the engine, saying it took a big sledgehammer to make enough room and 429 motor mounts from a `71 Mustang. He was surprised to see the car at all, thinking that it would have been in a wrecking yard by then. The end finally came for the Fairlane. I could no longer keep the car steering straight, even after countless adjustments and tweaks. 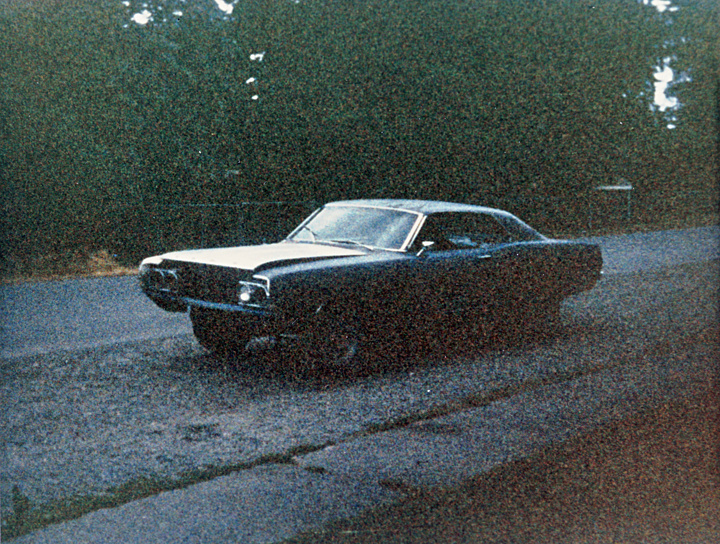 What the car really needed was a full-on front end rebuild using 428 Ranchero coil springs. But in the end the car’s body simply wasn’t worth the money necessary to fix it right. So my Dad and I started looking around for a car into which we could install the best part of the Fairlane — its 429. We eventually found a `68 Thunderbird two-door with no engine or trans, and the swap was made. 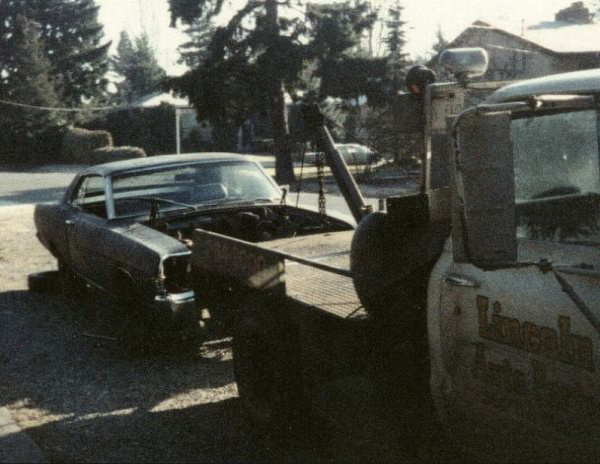 Lincoln Auto Wrecking hauled the Fairlane away for free on a warm spring day in 1984. Over his entire life, he brought water to boil in a pan then dumped in his coffee grounds – no filters or percolators. After a few more minutes of boiling he dumped the whole mix into this coffee cup. Pitch black. Sherry remembers vividly how there would be a layer of coffee grounds at the bottom of his cup. Donald died in 1984, so the recipe for his coffee is long gone. 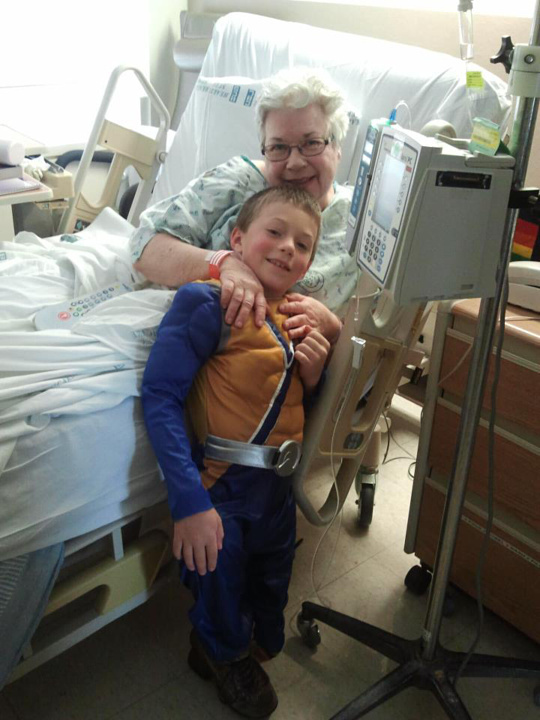 My mother-in-law Jan battled many illnesses for many years. In May 2013 she was in the hospital after having a brain tumor removed. The recovery for her was a roller coaster; one moment she was fine and recovering, and then the next she struggled with something else. The toll was great, not only on her but also on the family. We could only stand back and hope the doctors worked quick enough to complete her recovery puzzle. One night Sherry, Jack and I visited her at dinner time and talked for a while. I had my DSLR with me, to take advantage of the skyline views out of the 17th floor windows of the hospital. I also managed to take some profile pictures of Jack. Not long before we left, he lay his head in her lap; Jan quietly moved her hand to his back, her arm adorned with lines of alert bands prompting care givers to be wary of certain drugs or treatment. There were at least four of them, in many colors and different types of writing. It was this touching image of an elderly arm wrapping comfort around a seven-year old’s body that quickly made me think, “Take of picture of that.” But, out of quiet respect for the moment, I put the camera down. In short, I blew it. The next day Jan took a serious turn for the worse. She stopped breathing, right in front of the doctor. After being revived she was taken immediately to the ICU for heavy duty care. Then she was sleeping or in & out of consciousness. When we visited her next she was sleeping and wouldn’t wake up; part of me was bummed, and the other part was relieved because it meant she was finally getting some sleep. Still, that missed photo opportunity haunts me. The question for me revolves around the line between being the observer or being part of the moment. Leaving the camera alone meant that I was experiencing a very special gesture and smiling inside. Taking a picture would have interrupted the silence with a shutter snap; it just didn’t seem right at the time. But now as I think back, I regret that brief moment where the camera sat quietly, because it’s the image that now goes through my mind over and over. While the diagnosis for Jan was fatal, she recovered long enough to enjoy three more months with her family. I did get more pictures of her before she died, but none of them were as special as that one moment that I will remember forever. In 2001 I noticed that KurtClark.com was for sale. I didn’t really have a plan for it; I just felt it needed to be mine since all the others were nabbed by the same person. At the same time I grabbed the stunning Mrs. Clark’s name in .com form. Sure enough, about a year later, the other Kurt Clark sent me an email – asking if I would sign over the .us domain to him. And so it went over the next decade, as online content and providers began offering services. I managed to nab kurt.clark at Gmail in 2004. I picked up @KurtClark on Twitter in 2008, and on @KurtClark on Instagram in 2012. I get tweets, tags, and emails for him often still. Somehow I also managed to get kurt.clark in Outlook and Instagram before the social-savvy throngs hit the decks. Last year I was offered “kurtclark” on Google+ (I accepted gladly). And what I couldn’t get in my name I started using “BelRedRoad” instead. It’s like virtual real estate, and I will never EVER give it up. Now I finally have a use for the KurtClark.us domain I bought 15 years ago. As I was organizing the family room during a dream last night, my late mother-in-law walked into the room. Most of it was hers – stuff she’d purchased when she was alive. We took all the silverware from the different boxes and drawers, then placed them all on the tray. While Sherry and Jan talked I placed the tray on a shelf, in a way that would display the beautiful silver Jan owned during her life. For some reason my dream control was really strong.. It hardly ever is, and I rarely know I’m dreaming when I am. This time, I knew it was a dream and I knew my mother-in-law was a ghost in that dream. The most interesting things in the whole experience were that I wasn’t scared about the unknown, and that everything she touched was something she would have known in life. She handled nothing we acquired after her passing, and her presence there didn’t seem out of the ordinary. It just felt like another September day in 2008 when she was still with us.